In my second year, I have become a lazy beekeeper. Last year, oh so long ago, I inspected each hive every week or two. I visited the apiary nearly every day to visually check the hives. I kept close tabs on their progress, and worried about the many things that could go wrong. This year the bees have been fine, doing their bee stuff, and I’ve been working, travelling, and otherwise not looking in on them. For much of July this bothered me, and I felt guilty that I left the bees to their own designs. It was hot, many days over 100 F (38 C), and I was on the road one way or another for three out of the last four weeks. I just didn’t feel up to checking the hives, so I didn’t. I finally got into my five hives this weekend, and for the most part the bees are fine. Given my lack of blogging lately as well, I figured it was time for an update. With the summer solstice come and gone on June 21, the bees start to look towards winter. Each day is a bit shorter; and there are fewer flowers with nectar in the heat of the summer, especially in Virginia. The fall may or may not have a nectar flow, depending on the temperatures and the rain, so the bees and the beekeeper start to wonder. Is there enough food? Are the frames well positioned and organized? Is the varroa mite population low enough? These thoughts came to mind as I inspected the hives on Saturday and Sunday. These boxes sure can get heavy when there is a lot of honey in them. Thank goodness I settled on 8-frame hives. I also appreciate moving towards all mediums, as the deep boxes are especially heavy (even with only 8 frames). Configuration Three mediums, with a slatted rack and screen bottom board. Queen New queen emerged in the past two weeks. Mites Given she’s been split, swarmed, and most recently without a queen, I assume the mites are in check for now. My poor Jupiter. Split on April 11, swarmed on April 25. On July 10 I found lots of capped queen cells and no young brood, so she may have thrown yet another swarm. This weekend I found perhaps 10 medium frames of bees total, and not a lot of honey. Fortunately I saw some larva, so she has a queen. I will probably need to feed this hive soon as there is definitely not enough food for the summer, fall, and winter. Configuration Four mediums, with a slatted rack and screen bottom board. Queen Stopped laying after I treated for mites, seemed to resume about a month later. Mites Treated with one MAQS on April 25; did a sugar shake at the end of May and found a mite count of zero (0). Lots of brood yesterday and about 18 medium frames of bees. So the queen is laying well. A good bit of honey is available, even in the top box. So this hive looks good. I was hoping for a better honey crop, but treating during the nectar flow seemed to throw off the queen. I settled for a single fully-capped medium frame, which might just be my harvest for the year. I’ll have to keep an eye on her stores as we go into fall. Configuration Two deeps and one medium, with a solid bottom board. Queen From a queen cell as part of an April 11 split. Mites I did a sugar shake on July 10 and found 3 mites out of roughly 300 (1%). The recommendation is not to treat at this level, so I let it bee. Before I could figure out what to do the bees got a bit agressive and chased me away. I checked this hive after inpsecting Saturn, so I didn’t use much smoke initially. Probably a mistake. I walked away once after a sting on the hand (through my glove, no less), and then decided I should put the hive back together and clean up. I received another solid sting on my elbow (again through my suit) while I was putting supplies away. Ouch! Sometimes bees are aggressive because they are stressed by mites, lack of nectar, or poor beekeeping. I suspect the latter, though I should probably check the mites again soon just to be sure. I do enjoy checking these hives. I rarely use smoke, as the ability to pull a single frame at a time seems to disturb the bees less. Both of these hives have been very calm and gentle this year. Queen New Russian queen from Chris Hewitt, emerged from cage around June 1. Mites Treated with a single MAQS on April 25 when the count was high, after which the queen disappeared. Venus has 17 built-out combs, which is good. However there is not a lot of honey and only a few frames of bees, which is not good. This weekend I saw the queen and some larva, so I suspect the lack of food is keeping the population down. The bees are calm, I inspected without smoke. Given the lack of stores, I should probably feed this hive soon to keep it going through August. Queen From swarm on April 25. I’m guessing a virgin queen as she didn’t start laying until around May 10. Mites Have not checked yet this season. On Sunday I inspected the entire hive, all 15 combs, without using smoke. The hive is packed, and has been bearding more and more each week in this heat we’ve had. They gather in the meager shade of the cover to avoid the sun and remove their body heat from the hive. 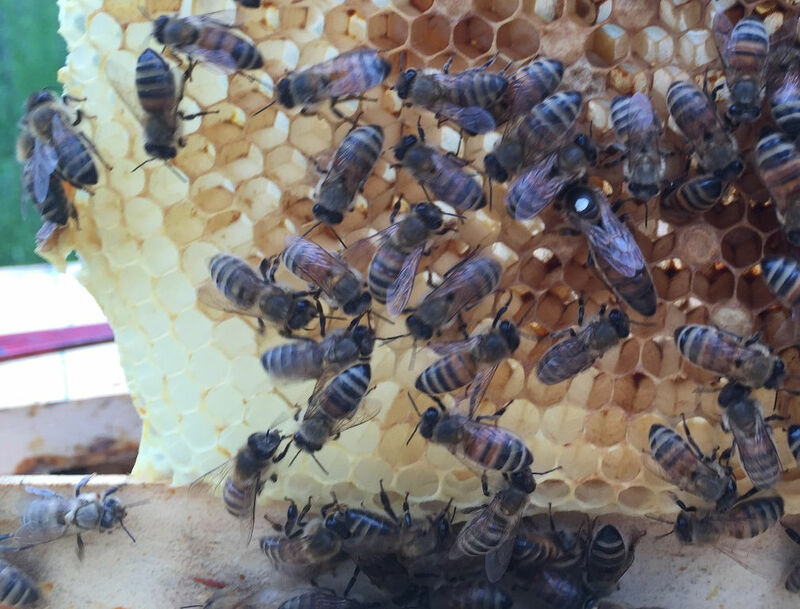 I found some brood on all but three frames, with a good bit of honey throughout the hive. Each comb in Saturn has about 1.6 times the area of the comb in Venus, so she is well-stocked for winter right now. In terms of temperament and production, this has been a great hive this season. Well, that’s the hive round-up. I hope to make some honey from Mar’s frame this weekend, and I’ll have to think about given Jupiter and Venus some sugar water fairly soon. This phrase comes from Ecclesiastes 3 of the King James Bible. To every thing there is a season, and a time to every purpose under the heaven. The verse was written into the song Turn! Turn! Turn! by Pete Seeger in 1962, which was in turn (!) popularized by the The Byrds in 1965. For me, the modified title captures both the idea that the bees are starting to look towards winter, and that each hive has its own personality and schedule. The nectar sources are in danger of drying up, and the days have started to shorten. The bees know this, and prepare accordingly. Some hives are strong and hunker down, like Ganymede, and others are struggling to get into winter like Jupiter and Venus. The bees have their own designs, and hopefully a beekeeper in case they need some help reaching the bounty of next spring. Thanks, I think. I’m not sure I like the visual of bees in my ears…. My elbow still itches. Great shot of the butterfly. Thanks. It was on the thistle, and just flew in front of the hives for me. 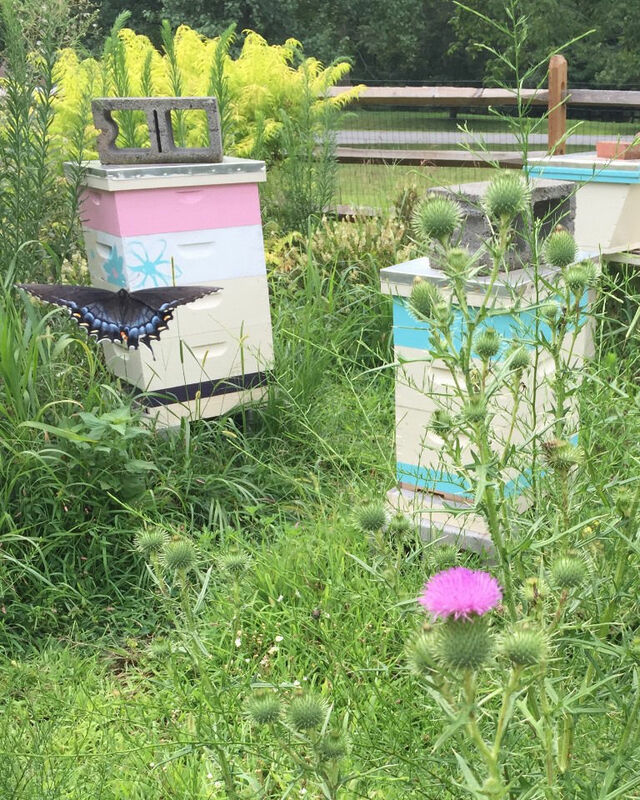 Your bees (and butterflies) look fantastic! 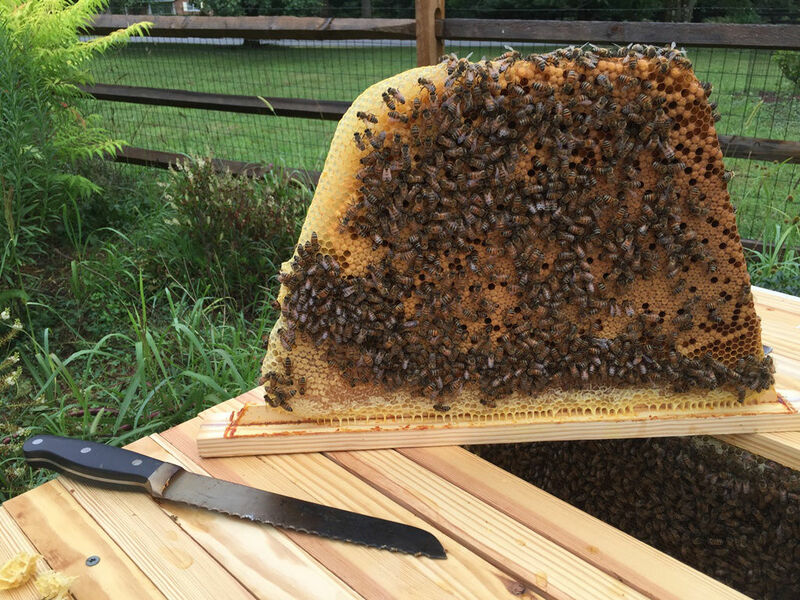 Congrats on your honey harvest — it looks delicious! Thanks, though I was hoping for more than a single frame…. It is sitting in the freezer right now, planning to take it out this weekend and crush what I can out of it.